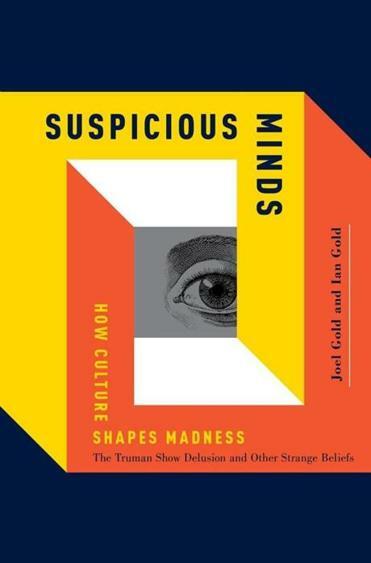 28book "Suspicious Minds" by Joel Gold and Ian Gold. A growing number of people believe they are being watched. Some live in cities where surveillance cameras abound. Some have found their way into the National Security Agency’s databases. Some are members of the Kardashian family. Only a few are, in fact, delusional. For these few, already prone to psychosis, the hypersurveillance of the digital age has become a hook on which to hang a set of false beliefs as old as madness itself: that external forces are influencing their thoughts and manipulating reality. Thematically, these delusions aren’t much different from those of an 18th-century Welshman who became famous for his conviction that he was being watched and controlled by spies using an “Air Loom,” which manipulated waves of animal magnetism using what was, at the time, the cutting-edge technology of pneumatic chemistry. In our time, the Air Loom delusion has given way to what Joel and Ian Gold call “the Truman Show delusion”: the belief that one is the unwilling star of his own reality show, his every action filmed and broadcast to millions of viewers. In “Suspicious Minds,’’ their incisive, insightful new book, the brothers describe the disorder as both novel in content and ancient in form, and fundamentally illuminating of the way that culture can both contribute to mental illness and influence the shape it takes. Joel, a psychiatrist, first encountered a patient suffering from the Truman Show delusion not long after the terrorist attacks of Sept. 11, 2001, when national tensions ran high and government surveillance reached unprecedented levels. The patient complained of an experience he compared to “The Truman Show,’’ the 1998 movie starring Jim Carrey as Truman Burbank, whose life is televised without his knowledge or consent until he realizes that his island home is a stage and the people on it merely players, paid to act as his friends and neighbors. Like Truman, Gold’s patient believed that the events in his life — including the 9/11 attacks — were being staged to evoke ratings-worthy responses from him. In the years that followed, when a number of other patients reported similar beliefs, Joel and Ian, a professor of philosophy and psychiatry, began to ponder the implications of this increasingly common malady. Through their collaboration, the two concluded that the accepted theory that psychosis boils down to the purely biological (so many misfiring neurons) was wrong and that culture (technology, ideas, and possibly the Kardashians) can do real mental harm. Interwoven with their theoretical discussions of mental illness are anecdotes about some of the many delusional patients Joel has treated. In both anecdote and argument, the voice is clear, witty, and engaging; the tone is by turns entertaining and alarming. After summarizing some well-established evidence for environmental influences on mental illness (higher schizophrenia rates have long been observed among immigrant groups, city dwellers, and victims of child abuse), the brothers Gold propose an intriguing new hypothesis to account for delusions: a malfunctioning “Suspicion System,” in which the cognitive system that has evolved to alert us to possible danger breaks down, becoming so overloaded by an abundance of real and perceived external threats that it can no longer discriminate between justifiable wariness and paranoia. Jennifer Latson is writing a narrative nonfiction book about Williams syndrome. Follow her on Twitter @JennieLatson.